yay! 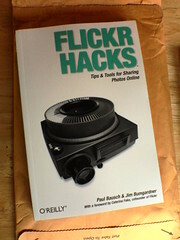 I'm a little late with this news, but Flickr Hacks is now available in physical book form! Is there someone you'd like to see posting their photos to Flickr but they haven't made the leap? Give the gift of Flickr Hacks. :) I think the book is a great introduction to the Flickrverse, and any reader will become a Flickr power user if they give some of the more advanced hacks a go. It's great to see the book in its final form, especially because this one was so much fun to work on. This picture is my copy of the book, and you can keep an eye on photos tagged with flickrhacks to see others.